Beyond the Black Rainbow (2010) is director Panos Cosmatos’s first feature: a psychedelic, sci-fi reverse vision of the future set in 1983 in the sinister Arboria complex, where inmates/customers are promised ‘a better happier you’. The film plays out as a dystopian set of power struggles between New-Age neuropsychologist Mercurio Arboria (Scott Hylands), his Frankenstein’s monster: Barry Nyle (Michael Rogers) and mute daughter Elena (Eva Bourne). Cosmatos says he wanted to create a ‘poisoned nostalgia’ that revelled in all the pleasure of a ‘Reagan-era fever dream inspired by hazy childhood memories of midnight movies and Saturday morning cartoons’. The film is an undeniable example of what music critic Simon Reynolds calls ‘retromania’, where producers of popular culture seem to have stopped in their tracks at 2000, and now make work that frantically cites and recycles music and films made between the 1960s and the 1990s. 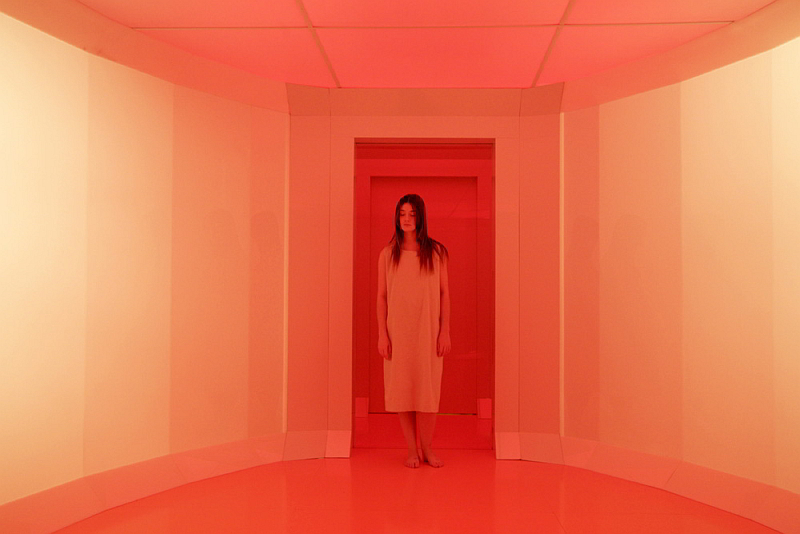 Beyond the Black Rainbow is seamless in its aesthetic rendition of a film produced in the 1980s. A familiar cult film trope used by Cosmatos is an investment in sparse dialogue, where symbolic slack is taken up by set, art direction, sound design and score – think of any of Dario Argento’s work, Stanley Kubrick’s 2001: A Space Odyssey (1968) and AndreiTarkovsky’s Solaris (1972), just to scratch the surface. Here, I’d suggest, lies cult cinema’s ties with the language of experimental and poetic filmmaking. The Black Rainbow script would seem unassuming on the page, such are the restrained, polite exchanges between the characters. Yet, the sound and sets expose these as patter floating on the surface of a brooding and repressed animosity felt by the characters. As such, in Black Rainbow, the audience is invited to sense through sound, a form of sonar navigation. Black Rainbow is a fan’s film and this is reflected in, to quote Reynolds, the ‘new old’ score. Composer Jeremy Schmidt, alias Sinoia Caves, uses original 1980s synths, such as the infamous Mellotron, used heavily in the 1970s and 1980s. It’s a mesmerising instrument that allows the musician to use a keyboard to play sound samples recorded onto magnetic tape, with choruses, strings and flutes being among the most classic examples used to great effect by Brian Eno and Goblin keyboard player and horror film composer Claudio Simonetti. Schmidt admits to ‘setting’ his music in the period Cosmatos wanted to recreate, and his score is remindful of a spectrum of sources, from New Age electronica styles to Tangerine Dream’s demonic, bassy film soundtracks for Sorcerer (1977) and The Keep (1983), for example. Then it would be churlish not to mention the huge creative homage to John Carpenter’s malevolent minimal synths, as well as some of Wendy Carlos’s psychotic synth-string pieces for The Shining – Carlos being the under-credited or cited synth genius who also produced music for Kubrick’s Clockwork Orange and the original Tron. Notably, her ‘Clockwork (Bloody Elevators)’, used for The Shining’s 1980 trailer, was described in her own words: ‘The sounds are Rachel’s (Elkind) versatile vocals with percussive and brassy synthesizer lines, all quite melodramatic.’ I’m not sure why Schmidt’s extraordinary soundtrack for Black Rainbow has not been released yet, but it should be. A theme of submersion extends throughout the film. In a flashback to 1966, Barry Nyle is reborn after sinking beneath black, primordial goo in an impressive psychedelic scene where Yves Klein meets Altered States. After this baptism he begins to transform, and takes medication to sublimate his symptoms. Mecurio Arboria retreats from reality and numbs the pain of the past and the future with narcotics. Elena’s psi/chotic abilities are subdued by Nyle’s manipulation of an unnamed, psychic power source: a glowing pyramid situated in the geometric psychological boiler room for the Arboria institute. All the characters are repressing something. So, sound is used to give insight into what is left unsaid and kept hidden. The pyramid energy is given a sensorium: a low frequency, migraine pulsing, oscillating synth. This sonic ident exists in both the symbolic reality of the film – in that it merges with the musical score and the ‘story’ of the film, and it appears to be a real sound when we see Nyle turning the control dial to vary the strength of these ‘energy sculpting’ emissions. It’s this permeability between diegetic and non-diegetic sound in the film, and a well-crafted score, which enable a symbolic reading of the sounds as the unspoken inner life of the alien/ated selves of the characters. The most poignant example of this, I think, is ‘Solace’ (as it is unofficially listed on YouTube), the stunning piece of music dubbed over some of the scenes featuring Elena. Here, choral layers, detuned reverberating synths and chords, which mainline melancholia, have their own charge – beyond the weight of references to Jean Michel Jarre, Harold Budd and Brian Eno. Notably, the theme of submersion creeps in on this track with a repeated note, remindful of the sonar ‘ping’ used for underwater sensing and measuring. With this sound, Schmidt samples an ubiquitous motif in sci-fi sound design and also suggests searching the void. The track as a whole echoes Elena’s sense of sadness for her familial loss and for her own deprivation, speaking for her while remaining ultimately unfathomable.